Today we look at Black Ship a company you might have known as Beaver Wood Wright Soaps. This new rebrand is so much fun I get a kick out of each new release. Today will be looking at Cap N Dark Side. Black Ship comes in a plastic white 6.0 oz. tub with a black screw on lid and the reason for this will become clearer as I explain about the label. 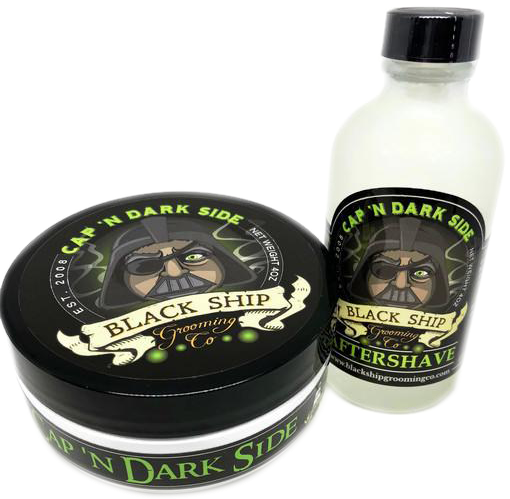 As the name implies Cap N Dark Side refers to the Star Wars craze that is currently going on in our culture once again. The label has a cartoon-like picture of a man in the Darth Vader helmet sporting an eye patch a Pirate Vader if you will. The side labels include Ingredients, Website location, Scent information. The scent of Cap N Dark Side is Leather, ozone, blackberry, amber, and ginger this list is from the website and is in the order I think they present themselves. Although I’m still trying to find ginger and amber Lather and blueberry seem to dominate the notes it could be just me your mileage may vary. The texture of this soap is extremely loose almost cream like you can swish it around with your finger. I bowl lather and it was extremely easy to place in the bowl. During the lather, I had to add a little more water than normal but nothing out of the ordinary. I was able to create a rich creamy lather in about a minute. This really got into my beard which had grown for about 6 to 7 days and the coverage was fantastic too. The slickness and glide are tops with Black Ship allowing me to go over stubborn places many times without irritation. The real surprise was a slight scent change not too far off from the original but a change none the less at least it did for me. So, I had a great shave with Cap N Dark Side and if you enjoy a good leather scented shaving soap don’t let this one pass you by. The notes are a unique combination that will keep you coming back to the Dark Side for more.